No matter the age of the cats or how much you think/want your cats to get along, you can’t force them to like each other. Putting them face to face or putting them in a room to let them “work it out” is not how you properly introduce cats, that’s how you ruin a relationship, and in some cases the cats may never fully get over that bad experience. 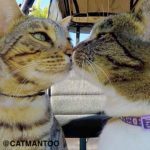 Doing it the right way however will greatly increase the likely hood of a positive relationship, but be prepared as it can take several days to several weeks (maybe longer) for cats to adjust to each other. Follow the advice as close as possible, listen to your cats, they’ll let you know when you can move to the next steps. If you get impatient and they have a bad 1st, 2nd, 3rd experience, this could leave a lasting impression and could effect their relationship from then on, it’s better to stop the session and try again another time/day, than it is to get impatient with this process. Think of every behavioural issue that you want to stop or manage being exactly like a person that has a phobia they want to cure. Let’s say it’s a fear of spiders, well, on day one, you wouldn’t place a bunch of spiders on the person to make their phobia go away. The first few sessions might be just talking about spiders in a positive way, once you’re comfortable with that, maybe looking at picture of a spider, then when you’re comfortable with that, maybe a spider in an aquarium at a far distance, and so on step by step. There could be weeks or months of this process to help desensitise you from your fear, and even if you do everything right, it usually doesn’t go from 100% disliking spiders to 100% liking them. after following all the steps there may just be a 50% improvement to your phobia. We’re going to use a systematic desensitisation approach while at the same time do our best to create a positive association whenever the cats smell each other, look at each other, and as they get closer and closer to each other. A crate/pet carrier is your friend, make sure you teach your cats (at least one of them) to love being in their crate/pet carrier. Keep them separated for the first 2 to 7+ days, letting them explore the house separately which will get them used to each others smells. Next, when allowed, and for short amounts of time throughout the day. carry one cat at a time around the home, like one would a new baby, sitting occasionally (far from the other cat at first), just do things you might do normally. All animals are wired to recognise and eventually except a new addition to the family/group/pack etc. Practice a few times per day and everyday until you notice less negative (if any) reactions and a more “curious” demeanor starts to develop, the one not being carried may start to come over to investigate. Stop the exercise whenever hissing happens. Note: If a cat doesn’t like being held, you can try to create a positive association with being held through practice sessions of picking up (holding) the cat and feed, or have the cat in your lap and feed. This technique can some time to sink in, but the more you only feed your cat in your lap, the more the cat will tolerate being picked-up/held (for short periods) (At least that’s what’s supposed to happen) your results will vary. Or use the pet carrier to carry your cat around. IMPORTANT: At or around this same time, you can mix in the following things. Have them interact/smell and or play with each other under a closed door or separated by a puppy/child gate/sliding glass door, etc.. use a toy in this case to create a positive association when each other is around. (Only advance when there is little to no sign of aggression. Using a toy, have them play with each other through a barely open door. Using no barrier, but with the cats comfortably separated, play with a cat using a feather toy (or other type) while the other cat watches from afar, This is a great way to keep them both focused on the toy and in a good mood which will help build their confidence being around each other. Note that during the play try not to cause them to jump at each other and risking them getting too close. if they both want the same toy, try using two toys. This is a great sign if they can play or eat while the other cat is nearby. AT this point, unless your cats are playing with each other and you have no aggression problems, I would strongly suggest doing this last very effective bonding exercise. Hold one cats in one hand and a spoon with a little super high value food in the other hand – ‘gamey’ raw meat (or can) food is best. Note: CATS MUST BE HUNGRY AND YOU MUST USE HIGH VALUE FOOD) – Walk up to the cat on the ground, try to feed them at a long arms length away. If your cat runs away, that’s okay, it happens. stop then try the same thing an hour or two later. (Make sure your cat doesn’t have access to food elsewhere). Practice 4 to 6 times per day. You may have to postpone this exercise and feed them using one of the other suggestions, then start up again the next day. Eventually the cat won’t run and will eat from the spoon, if the cat continues to eat while the other cat is in your arms (or in pet carrier) keep feeding. With each session crouch lower & lower to the ground until you can put the cat in your arms on your knee, allow your cats to take turns eating off the spoon (if they stop eating, they may be full or you’ve gotten too close. LAST STEP before using the clicker – Try placing the cat on the ground, (again, take turns feeding them both). The goal is to get the 2 cats on the ground within reach of you. This will free up your hands so you can immediately add clicker training, this will really help speed the process up and continue to create a positive association with each other. AGAIN DON’T TRY THIS UNLESS THEY ARE HUNGRY. if they are hissing or running away, you might be getting ahead of yourself. stop the session and try hours later or the next day. USING THE CLICKER – Whenever your cats look at each other, get closer to each other, walk towards each other, are not hissing at each other while they are close, CLICK & FEED. If it seems that you have one friendly cat and one aggressive cat, focus mostly on the aggressive cat making sure they get the clicks and treats. END the session Once your cats start turning away from the food (getting full), try again later. Anytime there is a negative confrontation stop the session and try again another time, you’ll be AMAZED at what gets carried over to the next session, that’s why you have to have patience. If you push this process and they fight, then your chances of them getting along becomes less realistic. FYI – When Didga and Rascal, Didga and Boomer were at this point, there was never any hissing while I was clicking and feeding. I hope you’re getting the same results. When you feel like they are ready to meet, pick the room that has cat tree’s or something they can climb on if they need to get away from the other cat. Be involved in their meeting, don’t just put them in the same room and stand back and watch, I don’t want you to get hurt but if one is a young kitten, I might get right in-between them and pat, tease play and or treat while they are close…. Let me reiterate, please don’t push them into a relationship, patience is the key. WITH THAT SAID, there are cats that no matter what you do, they will not 100% tolerate another cat(s). If you’re following my advice, step by step, over days, weeks or months but not seeing the change/progress I’m talking about, then you may have one of those cats that just never will get a long. then it becomes a situation of just managing their behaviour, OR if the stress on both the cats is too much and it’s been months and months of trying, finding a home for one might be best for all involved. If you read this post and/or found my advice helpful, please let me know in the comments below, that way I’ll be encouraged to give more advice. and maybe, if I get enough interest, I’ll make a video tutorial to REALLY show exactly how to do this cat introduction thing. Have tried most of this but have this KITTEN that the very second he enters the same room with any of the other three he runs and jumps on their head. He is extremely playful. If we could get him to stop jumping on the other three we think we would be fine. He is now getting bigger, have had them separated for 2 months now and think it is getting worse instead of better. We let the older ones just kind of smack him, no injuring, but he just doesn’t get it and keeps going back for more. I was wondering which cat it is best to do the carry around with. Is it best to do it with the older cat and let the new kitten watch, so that the other one doesn’t feel left out? HI Melissa, it has nothing to do with being “left out.” or how you think they’re “feeling” That’s putting human emotions into animal behaviour. Animals don’t think the same. You carry whichever allows you to carry them. Switch between the two if they both don’t mind, carry for as little or as long as they are comfortable.